There’s other great features (and the wealth of amazing Adams artwork) in this issue too, so get it HERE! This entry was posted in TNT on 25 November 2013 by Mr. Morrow. 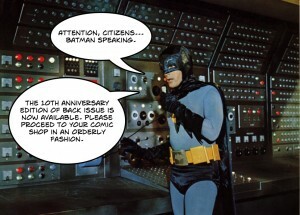 In case you didn’t get the message from our friend here, Back Issue #69 celebrates the magazine’s 10th Anniversary by revisiting the 100th, 200th, 300th, 400th, and 500th issues of 1970s and ’80s comic book favorites. 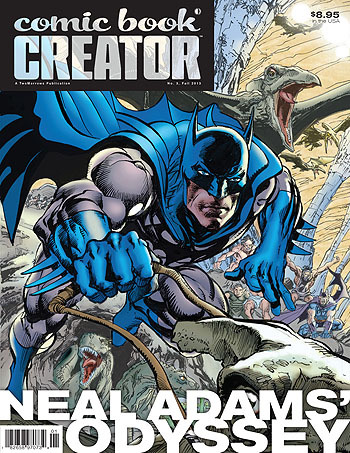 It features articles and spotlights on Comics’ Anniversary issues including: Adventure Comics, Amazing Spider-Man, Avengers, Batman, Brave & Bold, Casper, Detective Comics, Flash, Green Lantern, Showcase, Superman, Thor, Wonder Woman, and others. An all-star line-up of interviews and art includes JIM APARO, MIKE W. BARR, STEVE ENGLEHART, KEITH POLLARD, MIKE SEKOWSKY, WALTER SIMONSON, JOE STATON, and MARV WOLFMAN. Plus, this issue closes out the Man of Steel’s 75th Anniversary with a guest editorial by LARRY TYE, author of the critically acclaimed book Superman: The High-Flying History of America’s Most Enduring Hero. 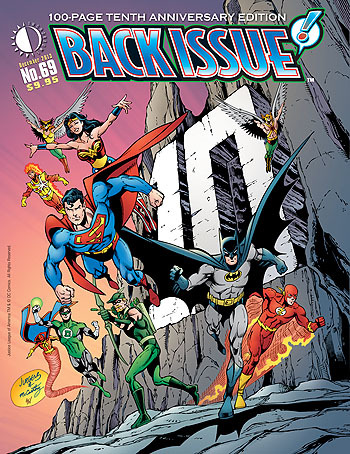 It sports a cover by DAN JURGENS and RAY McCARTHY featuring ten Bronze Age Justice Leaguers—one for each year of Back Issue. Back Issue is edited by former DC and Dark Horse Comics editor MICHAEL EURY, who’s put up with me as his publisher for a decade now (which should earn the poor guy some kind of medal). You can order the issue HERE. Our 40,000th customer to order directly from us! • LEGO titles, and more! And when you order the discounted print edition, you get the digital edition free where available. But the sale is only good for 10 days (through December 1). NOTE: We predict a huge response to this sale, and expect the TwoMorrows shipping elves will be backlogged with holiday shipments by the end of the month. So order early; the longer you wait, the more likely you’ll see a delay in having your package shipped. If delivery before Christmas is critical to you, be sure to choose expedited shipping (Priority Mail or Priority Mail International), as we can’t guarantee it otherwise. And thanks for being a part of our 20 years of success; we couldn’t have made it 20 years without you! I hope you and your loved ones enjoy a splendid holiday season and a prosperous New Year! This entry was posted in TNT on 21 November 2013 by Mr. Morrow.